Clinical advantages of FCV® ventilation through small lumen will be presented at the upcoming Euroanaesthesia, the major yearly European congress in the field of anesthesia. Four randomized controlled trials, comparing ventilation of specific patient populations with FCV® using Evone and Tritube to conventional methods, have been accepted for publication. These studies demonstrate that FCV® provides improved surgical conditions during upper airway surgery, higher efficient ventilation and better lung recruitment compared to volume controlled ventilation. 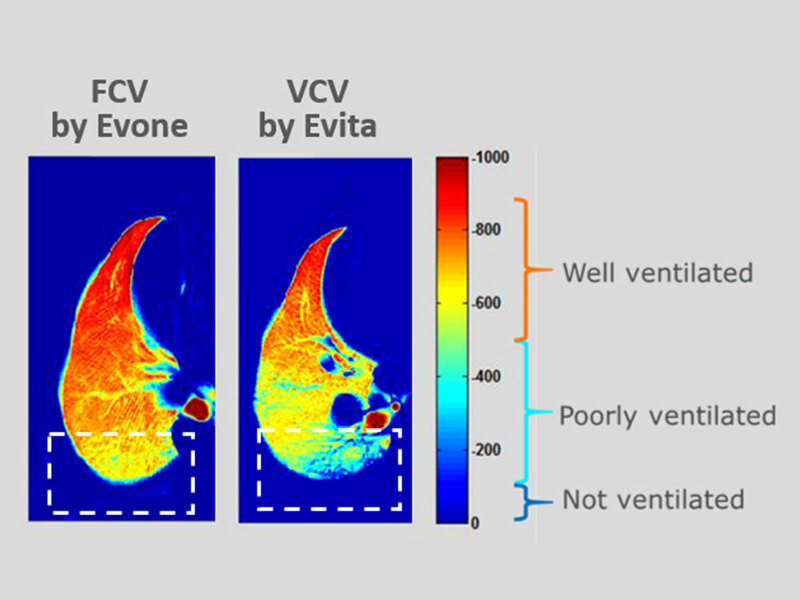 The first comparative study evaluating a commonly applied VCV protocol with FCV® mode by Evone in healthy pigs showed that FCV® improved lung aeration and consequently increased arterial oxygenation by 10%, while using a 21% lower minute volume. After six hours of ventilation with comparable PEEP and peak pressures, dynamic CT scans revealed improved recruitment of dorsal lung areas with FCV® compared to VCV. Moreover, these findings suggest that FCV® is a new approach for lung protective ventilation. Read more. Mazo V, Sabaté S, et al. Prospective external validation of a predictive score for postoperative pulmonary complications. Anesthesiology. Anesthesiology. 2014 Aug;121(2):219-31. Serpa Neto A, Hemmes SN, et al. Incidence of mortality and morbidity related to postoperative lung injury in patients who have undergone abdominal or thoracic surgery: a systematic review and meta-analysis. Lancet Respir Med. 2014;2:1007–15. Canet J, Gallart L, et al; ARISCAT Group. Prediction of postoperative pulmonary complications in a population-based surgical cohort. Anesthesiology. 2010 Dec;113(6):1338-50. Canet J, Sabaté S, et al. Development and validation of a score to predict postoperative respiratory failure in a multicentre European cohort: a prospective, observational study. Eur J Anaesthesiol. 2015;32:458–70. Weiser TG, Makary MA, et al; Standardised metrics for global surgical surveillance. Lancet. 2009;374:1113–7. Canet J, Gallart L. Postoperative respiratory failure: pathogenesis, prediction, and prevention. Curr Opin Crit Care. 2014 Feb;20(1):56-62. doi: 10.1097/MCC.0000000000000045. Review. PubMed PMID: 24240985. Jammer I, Wickboldt N, Sander M, Smith A, Schultz MJ, Pelosi P, Leva B, Rhodes A, Hoeft A, Walder B, Chew MS, Pearse RM; European Society of Anaesthesiology (ESA) and the European Society of Intensive Care Medicine (ESICM); European Society of Anaesthesiology; European Society of Intensive Care Medicine. Standards for definitions and use of outcome measures for clinical effectiveness research in perioperative medicine: European Perioperative Clinical Outcome (EPCO) definitions: a statement from the ESA-ESICM joint taskforce on perioperative outcome measures. Eur J Anaesthesiol. 2015 Feb;32(2):88-105. doi: 10.1097/EJA.0000000000000118. PubMed PMID: 25058504. Amar D, Munoz D, Shi W, Zhang H, Thaler HT. A clinical prediction rule for pulmonary complications after thoracic surgery for primary lung cancer. Anesth Analg. 2010 May 1;110(5):1343-8. doi: 10.1213/ANE.0b013e3181bf5c99. Epub 2009 Oct 27. PubMed PMID: 19861366. Rahmanian PB, Kröner A, Langebartels G, Özel O, Wippermann J, Wahlers T. Impact of major non-cardiac complications on outcome following cardiac surgery procedures: logistic regression analysis in a very recent patient cohort. Interact Cardiovasc Thorac Surg. 2013 Aug;17(2):319-26; discussion 326-7. doi: 10.1093/icvts/ivt149. Epub 2013 May 10. PubMed PMID: 23667066; PubMed Central PMCID: PMC3715168. Lawrence VA, Hilsenbeck SG, Mulrow CD, Dhanda R, Sapp J, Page CP. Incidence and hospital stay for cardiac and pulmonary complications after abdominal surgery. J Gen Intern Med. 1995 Dec;10(12):671-8. PubMed PMID: 8770719. Smetana GW, Lawrence VA, Cornell JE; American College of Physicians. Preoperative pulmonary risk stratification for noncardiothoracic surgery: systematic review for the American College of Physicians. Ann Intern Med. 2006 Apr 18;144(8):581-95. Review. PubMed PMID: 16618956. Khuri SF, Henderson WG, DePalma RG, Mosca C, Healey NA, Kumbhani DJ; Participants in the VA National Surgical Quality Improvement Program. Determinants of long-term survival after major surgery and the adverse effect of postoperative complications. Ann Surg. 2005 Sep;242(3):326-41; discussion 341-3. PubMed PMID: 16135919; PubMed Central PMCID: PMC1357741. LAS VEGAS investigators. Epidemiology, practice of ventilation and outcome for patients at increased risk of postoperative pulmonary complications: LAS VEGAS – an observational study in 29 countries. Eur J Anaesthesiol. 2017 Aug;34(8):492-507. doi: 10.1097/EJA.0000000000000646. PubMed PMID: 28633157; PubMed Central PMCID: PMC5502122. De Gasperi Feltracco P, Ceravola E, Mazza E. Pulmonary complications in patients receiving a solid-organ transplant, Crit Care 2014; 20 (4) 411-419. McAlister FA, Bertsch K, Man J, Bradley J, Jacka M. Incidence of and risk factors for pulmonary complications after nonthoracic surgery. Am J Respir Crit Care Med. 2005 Mar 1;171(5):514-7. Epub 2004 Nov 24. PubMed PMID: 15563632. Kor DJ, Warner DO, Alsara A, Fernández-Pérez ER, Malinchoc M, Kashyap R, Li G, Gajic O. Derivation and diagnostic accuracy of the surgical lung injury prediction model. Anesthesiology. 2011 Jul;115(1):117-28. doi: 10.1097/ALN.0b013e31821b5839. PubMed PMID: 21694510; PubMed Central PMCID: PMC3986041. Canet J, Gallart L. Predicting postoperative pulmonary complications in the general population. Curr Opin Anaesthesiol. 2013 Apr;26(2):107-15. doi: 10.1097/ACO.0b013e32835e8acd. Review. PubMed PMID: 23407154. Kor DJ, Lingineni RK, Gajic O, Park PK, Blum JM, Hou PC, Hoth JJ, Anderson HL 3rd, Bajwa EK, Bartz RR, Adesanya A, Festic E, Gong MN, Carter RE, Talmor DS. Predicting risk of postoperative lung injury in high-risk surgical patients: a multicenter cohort study. Anesthesiology. 2014 May;120(5):1168-81. doi: 10.1097/ALN.0000000000000216. PubMed PMID: 24755786; PubMed Central PMCID: PMC3999474. Futier E, Marret E, Jaber S. Perioperative positive pressure ventilation: an integrated approach to improve pulmonary care. Anesthesiology. 2014 Aug;121(2):400-8. doi: 10.1097/ALN.0000000000000335. Review. PubMed PMID: 25050494. Riss S, Mittlböck M, Riss K, Chitsabesan P, Stift A. Intraoperative complications have a negative impact on postoperative outcomes after rectal cancer surgery. Int J Surg. 2014;12(8):833-6. doi: 10.1016/j.ijsu.2014.07.003. Epub 2014 Jul 9. PubMed PMID: 25014647. O’Gara B, Talmor D. Perioperative lung protective ventilation. BMJ. 2018 Sep 10;362:k3030. doi: 10.1136/bmj.k3030. Review. PubMed PMID: 30201797. PROVE Network Investigators for the Clinical Trial Network of the European Society of Anaesthesiology, Hemmes SN, Gama de Abreu M, Pelosi P, Schultz MJ. High versus low positive end-expiratory pressure during general anaesthesia for open abdominal surgery (PROVHILO trial): a multicentre randomised controlled trial. Lancet. 2014 Aug 9;384(9942):495-503. doi: 10.1016/S0140-6736(14)60416-5. Epub 2014 Jun 2. PubMed PMID: 24894577. Treschan TA, Kaisers W, Schaefer MS, Bastin B, Schmalz U, Wania V, Eisenberger CF, Saleh A, Weiss M, Schmitz A, Kienbaum P, Sessler DI, Pannen B, Beiderlinden M. Ventilation with low tidal volumes during upper abdominal surgery does not improve postoperative lung function. Br J Anaesth. 2012 Aug;109(2):263-71. doi: 10.1093/bja/aes140. Epub 2012 Jun 1. PubMed PMID: 22661750. Sundar S, Novack V, Jervis K, Bender SP, Lerner A, Panzica P, Mahmood F, Malhotra A, Talmor D. Influence of low tidal volume ventilation on time to extubation in cardiac surgical patients. Anesthesiology. 2011 May;114(5):1102-10. doi: 10.1097/ALN.0b013e318215e254. PubMed PMID: 21430518; PubMed Central PMCID: PMC3500383. Unzueta C, Tusman G, Suarez-Sipmann F, Böhm S, Moral V. Alveolar recruitment improves ventilation during thoracic surgery: a randomized controlled trial. Br J Anaesth. 2012 Mar;108(3):517-24. doi: 10.1093/bja/aer415. Epub 2011 Dec 26. PubMed PMID: 22201185. Severgnini P, Selmo G, Lanza C, Chiesa A, Frigerio A, Bacuzzi A, Dionigi G, Novario R, Gregoretti C, de Abreu MG, Schultz MJ, Jaber S, Futier E, Chiaranda M, Pelosi P. Protective mechanical ventilation during general anesthesia for open abdominal surgery improves postoperative pulmonary function. Anesthesiology. 2013 Jun;118(6):1307-21. doi: 10.1097/ALN.0b013e31829102de. PubMed PMID: 23542800. Futier E, Pereira B, Jaber S. Intraoperative low-tidal-volume ventilation. N Engl J Med. 2013 Nov 7;369(19):1862-3. doi: 10.1056/NEJMc1311316. PubMed PMID: 24195559. Choi ES, Oh AY, In CB, Ryu JH, Jeon YT, Kim HG. Effects of recruitment manoeuvre on perioperative pulmonary complications in patients undergoing robotic assisted radical prostatectomy: A randomised single-blinded trial. PLoS One. 2017 Sep 6;12(9):e0183311. doi: 10.1371/journal.pone.0183311. eCollection 2017. PubMed PMID: 28877238; PubMed Central PMCID: PMC5587235. Bluth T, Teichmann R, Kiss T, Bobek I, Canet J, Cinnella G, De Baerdemaeker L, Gregoretti C, Hedenstierna G, Hemmes SN, Hiesmayr M, Hollmann MW, Jaber S, Laffey JG, Licker MJ, Markstaller K, Matot I, Müller G, Mills GH, Mulier JP, Putensen C, Rossaint R, Schmitt J, Senturk M, Serpa Neto A, Severgnini P, Sprung J, Vidal Melo MF, Wrigge H, Schultz MJ, Pelosi P, Gama de Abreu M; PROBESE investigators; PROtective VEntilation Network (PROVEnet); Clinical Trial Network of the European Society of Anaesthesiology (ESA). Protective intraoperative ventilation with higher versus lower levels of positive end-expiratory pressure in obese patients (PROBESE): study protocol for a randomized controlled trial. Trials. 2017 Apr 28;18(1):202. doi: 10.1186/s13063-017-1929-0. Erratum in: Trials. 2017 Jun 1;18(1):247. PubMed PMID: 28454590; PubMed Central PMCID: PMC5410049. Wirth S, Springer S, Spaeth J, Borgmann S, Goebel U, Schumann S. Application of the Novel Ventilation Mode FLow-Controlled EXpiration (FLEX): A Crossover Proof-of-Principle Study in Lung-Healthy Patients. Anesth Analg. 2017 Oct;125(4):1246-1252. 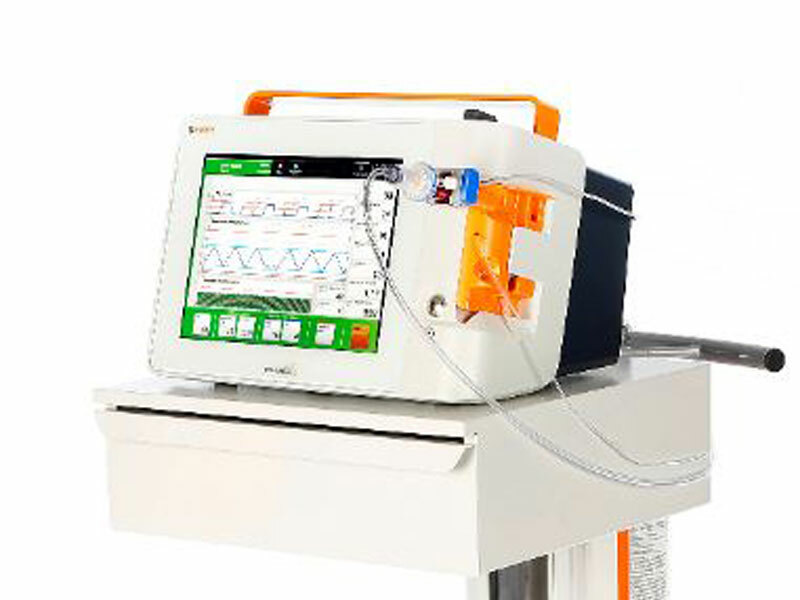 Schmidt J, Wenzel C, Mahn M, Spassov S, Schmitz HC, Borgmann S, Lin Z, Haberstroh J, Meckel S, Eiden S, Wirth S, Buerkle H, Schumann S. Improved lung recruitment and oxygenation during mandatory ventilation with a new expiratory ventilation assistance device: A controlled interventional trial in healthy pigs. Eur J Anaesthesiol. 2018 Oct 35(10):736-744. Schmidt J, Günther F, Weber J, Wirth S, Brandes I, Barnes T, Zarbock A, Schumann S, Enk D. Flow-controlled ventilation during ear, nose and throat surgery. A prospective observational study. Eur J Anaesthesiol. ePub 2019 Feb 5. Schmidt J, Günther F, Weber J, Wirth S, Schumann s. Improved airway management and ventilation with a cuffed endotracheal tube with an outer diameter of 4.4 mm for laryngeal surgery – a randomized controlled trial. Euroanaesthesia 2019, Abstract 3269. Weber J, Straka L, Schmidt J, Borgmann S, Wirth S, Schumann S. Flow-controlled ventilation improves end-expiratory lung volume in obese patients – a crossover controlled interventional trial. Euroanaesthesia 2019, Abstract 3315. Weber J, Schmidt J, Straka LMM, Wirth S, Schumann S. Flow-controlled ventilation improves oxygenation in mechanically ventilated lung-healthy patients – a crossover controlled interventional trial. Euroanaesthesia 2019, Abstract 3301. Kristensen MS, Abildstrøm HH. Endotracheal video-laryngoscope guided intubation with a 2.4 mm cuff’ed tube and active expiration by a dedicated ventilator versus a standard tube/ventilator. A randomized single blinded study in patients with a predicted difficult airway. – A paradigm shift in airway management? 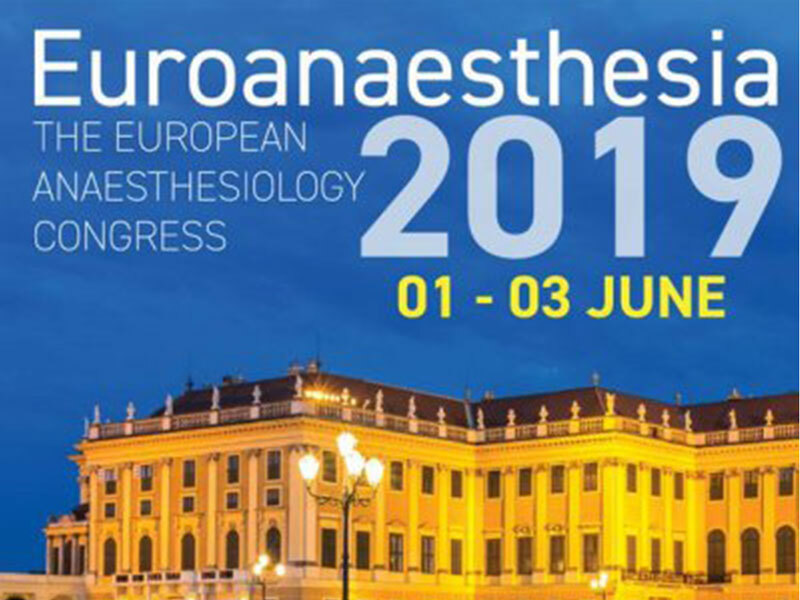 Euroanaesthesia 2019, Abstract 3755.